Sognani makes it Three Winners in Two Days! After heading to the spelling paddock following a gallant third placing on debut as a two-year-old, promising filly Sognani (pictured) made light work of her rivals when winning stylishly at Geelong yesterday making it three winners in two days for the Ballymore team. Carrying the colours of long-time client Lib Petagna, Sognani derives from the same family as his three-time Group 1 winner Lucia Valentina. 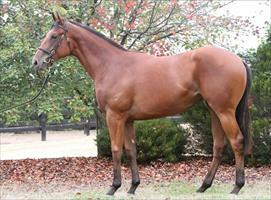 The bay filly by Magic Albert is raced in conjunction with Ballymore Stables Australia and Grant Devonport. “She missed the start initially, but rallied to get into a better position and she put them away nicely,” trainer Mike Moroney said. Sognani was purchased by Paul Moroney Bloodstock at the 2015 William Inglis Classic Yearling Sale for a modest $55,000. Looking to extend the purple patch of form at Sandown today will be first starters San Vincenzo, Top Of The Range and the talented Barthelona. “San Vincenzo is forward enough to be competitive in his debut outing and has showed plenty of class at home – a win wouldn’t come as any surprise,” Moroney said of the three-year-old colt by So You Think. Fellow three-year-old colt Top Of The Range (Savabeel) has also showed some class during his time in New Zealand before heading across the ditch, although Moroney is happy to see him produce a nice effort and should take improvement for the outing. “I would think he’d need the run and improve from it greatly,” Moroney said. Bathelona (Zoffany) was super impressive when winning on debut last preparation and will look to take on more lucrative assignments as the season presses on.